HitchBOT, a friendly hitchhiking robot that became famous on social media during its travels through Canada and Europe has been destroyed while on a trip across the United States. HitchBOT was designed by a team of Canadian researchers as a social experiment to explore the relationship between humans and technology. Smith and Zeller would soon find out. In 2014, hitchBOT set out from Halifax on a cross-Canada tour that ended in Victoria, B.C. Though there were fears hitchBOT would be destroyed or kidnapped along its unaccompanied trek, the robot reached the West Coast relatively unscathed, thanks to the kindness of strangers who provided rides and sometimes, lodging. Apart from a tune-up in Toronto and a small crack in the clear plastic part of its head, no medical care was required. The robot couldn’t move by itself, with the exception of its hitchhiking arm and finger, and was therefore dependent on the goodwill of strangers, Zeller told CTV News Channel in 2014 interview. Designed to be a talking travel companion, hitchBOT could toss out factoids and carry limited conversation. The robot would automatically snap a photo every 20 minutes to document its travels. After successfully travelling across Canada and parts of Europe, the robot set off on a tour of the U.S. in mid-July, visiting a variety of sites in Massachusetts and New York before meeting its demise in Philadelphia. Hitchhiking, it turns out, is no less dangerous for robots as it is for humans. HitchBOT, the beloved robot who bummed and thumbed its way across Canada and two European countries, met its untimely demise in Philadelphia on Saturday. Vandals took apart the Ontario-built robot, sending online photos of its disembodied parts to the project’s creators. “Someone ripped off the arms and the head is missing,” said Ryerson University communications professor Frauke Zeller, one of two project leaders. After receiving the photos, she and co-creator David Harris Smith checked online to see whether the battery was still going. 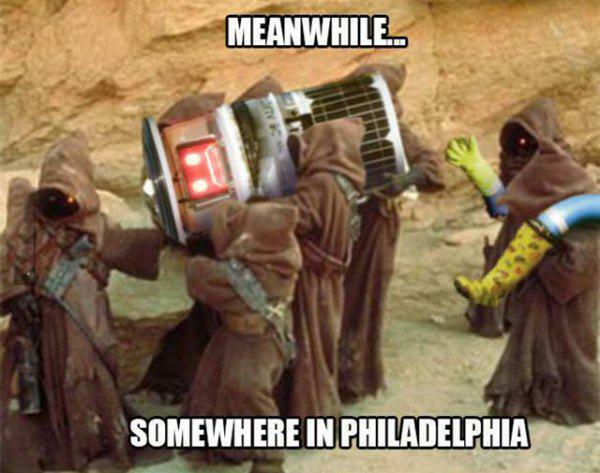 True to suspicion, HitchBOT had performed its last operational shutdown. “We want to reflect on what happened to see what we can learn from it,” Zeller said. “We were all shocked and saddened by it,” she said. “Anybody who is basically taking HitchBOT apart to salvage valuable parts will be disappointed,” added Smith, who teaches communications at McMaster University. Along with bright red eyes and a wide smile on its bucket head, HitchBOT was born with a motherboard, tablet and camera, but its functions are programmed to allow for limited engagement with humans, disappointing possible thieves. “Bad things happen to good robots,” the two self-described HitchBOT family members said in unison when the Star reached them in their homes Saturday night. Yeah, I have the feeling that they'll go all Skynet on us because of this kind of crap. Sigh. I wish I could say I am surprised. But I'm not. Vaguely surprised that it made it through New York. Not surprised it was destroyed in Philly though. I've been there. It's part of the reason I refuse to live in large cities. When I heard about this I figured it was just random vandalism though. But according to the article, they sent pictures of their destruction to the creators. That's just cruel. Viciousness and spite for their own sake. Yet it made it across Canada and parts of Europe without anybody feeling the need to destroy something that is completely harmless. My desire to leave the US forever keeps increasing. My desire to leave the US forever keeps increasing. Don't bother. It is characteristic, and inevitable, that we are most keenly aware of the deficiencies of our immediate surroundings. I have often thought of and discussed where to go to get away from present Britain (Norway is my favourite alternative) - but I know I won't, and that if I did I would just start on a journey of new disappointments. Yes, I am aware of human nature and people being people wherever you go. But so many of the issues that I have the most problem with are very strong here. The type of pointless violence shown here is just one of those. Refusal to provide adequate health care and support for citizens, backwards attitudes on human rights, the wealthiest having carte blanche to do whatever they want to whomever they want and getting away with it nearly all of the time... Sure there are countries worse than the US in these regards. But there are better as well. And living in this mire and muck, feeling like all your fighting is just slowing down your inevitable demise at the hands of a system that is not uncaring, but actively trying to destroy you bit by bit so that people can profit just that slightest bit more... It's wearying. And when he got home, he jacked off. Many migrants feel differently, including myself. However critical I might be of Australia, I acknowledge the great advantages I have gained from my family's decision to move. I love how everyone heard, "It happened in Philly," and they were like, "Of course." A pair of YouTube pranksters have admitted to faking a surveillance video that purported to show the destruction of the hitchhiking Canadian robot hitchBOT. YouTube star Jesse Wellens of PrankvsPrank and his friend Ed Bassmaster revealed in a new video how they faked the footage. However, Wellens denies that they were the ones who destroyed hitchBOT. Philly does have a reputation. And it is a deserved one. Personally, I think they're a couple of dicks. And we wonder why they don't go Cylon on us.